After only day back from Finland, it was time to head out again. This time, my girlfriend and I were off across the Atlantic to sunny Texas. VERY sunny Texas. This hasn’t been my first time in Texas this year, but it was my first time exploring a different region of the state – San Antonio. A place where it’s hotter and the culture is distinctly more in keeping with its Mexican connection. The convention: San Japan. One of the conventions which many of my acquaintances had recommended over the last few months when I got a request from the con chair to join LittleKuriboh and the rest of the TeamFourStar posse. How could I say no? I had heard good stuff about this event and that stuff was pretty accurate! 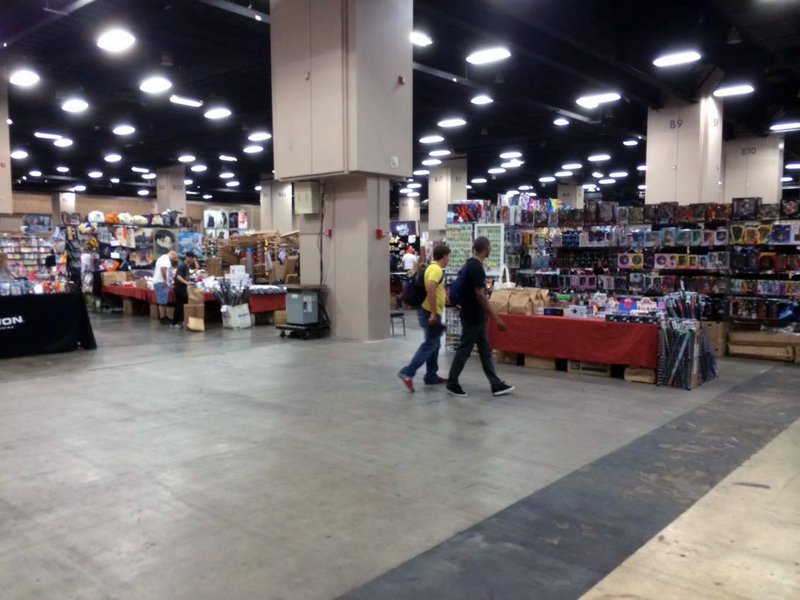 San Japan has been around in some shape or form since 2005 with its first event two years later. Since then, it has steadily grown in size peaking at over fourteen thousand attendees this year. When I arrived on the Wednesday night prior to the event I was greeted by the head of guest relations, Ken, who drove us from the airport to the Grand Hyatt in downtown San Antonio. We were both tired but we were happy to see him and chat a little before being even happier with the sight of a bed. The Thursday was spent to some light sightseeing of the famous Riverwalk which is located right by the hotel where the convention is situated as well as greeting the rest of the TeamFourStar gang as they trickled in later that day. I also got to properly meet Uncle Yo after briefly seeing him at Otakon the year before and he was a cool bloke; really got on with him as we hung out in the green room and walked past one another during the weekend. One of the highlights was a boat ride on the Riverwalk laid on for the guests at night – it’s a very beautiful and calming experience. If you are going to do the boat ride while you’re in the city, do it at night. I guarantee you will not be disappointed. Suffice to say, the choices of things to do around the convention site are long and numerous – you will not be bored! As for the con itself, I was worked pretty hard! I was planning to stay a few days after the con and in return I agreed to do some more panels and help judge the AMV contest on the Saturday which did mean missing a TeamFourStar autograph session but it couldn’t be helped! I always give autographs if people ask for them. My duties included laying on a voice acting panel, joining LittleKuriboh on his panel to add a distinct British flavour to the Texan menu, judging the AMV contest as well as the autograph signings, main panels and VIP sessions which the rest of the TeamFourStar crew were doing. It meant that I wasn’t bored in the slightest but I was pretty tired – a good kind of tired though. The type of tired which comes when you know you’ve done a good job. Most of these panels went by very well and I was happy to be with my friends on these panels well-received by thousands of congoers. The voice acting panel in particular was neat. I had honestly forgotten about agreeing to do it and I quickly had to think about stuff to talk about but thankfully I had a receptive audience who had plenty of questions to ask regarding the medium. It was great to see such an enthusiastic bunch wanting to get into the field. One girl in particular was taking notes with a fervoured expression and came up to me afterwards asking for clarification like her life depended on it! Several people came up to me afterwards actually – it was nice to have a gang of people asking for more. 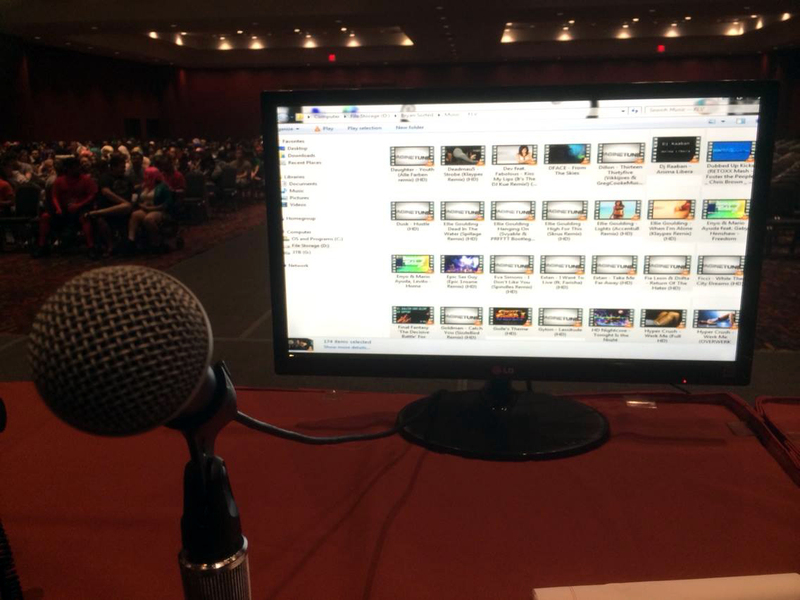 I definitely have to thank Dave [the con chair of San Japan] for getting me back into doing AVA [amateur voice acting] panels! You know how I said that most of the panels went by OK? Well..the AMV contest – oh dear. For an event that was meant to be three hours, simply show AMVs and judge the best, it was a logistical mess. The group that had been asked to conduct it on behalf of San Japan were friendly when things weren’t so frantic, but when the problems with playback of the videos and the wiring of the computers kept haunting the group things started to get very tense and tempers frayed; it left me feeling me a little awkward as the crowd filtered out. A solution to the problem? Just plug a laptop in and make a playlist, let it run and judge them as they play. Simple! Why all the faff of carrying a heavy PC onto the stage as well as a printer and two monitors? Oh well! Lessons learned for next year. One thing to point out that the convention itself did the best they could with assisting the outside group in terms of getting wires and holding dodgy cables in place for up to twenty minutes at a time. Other than that blemish, the con staff and panels went by swimmingly. 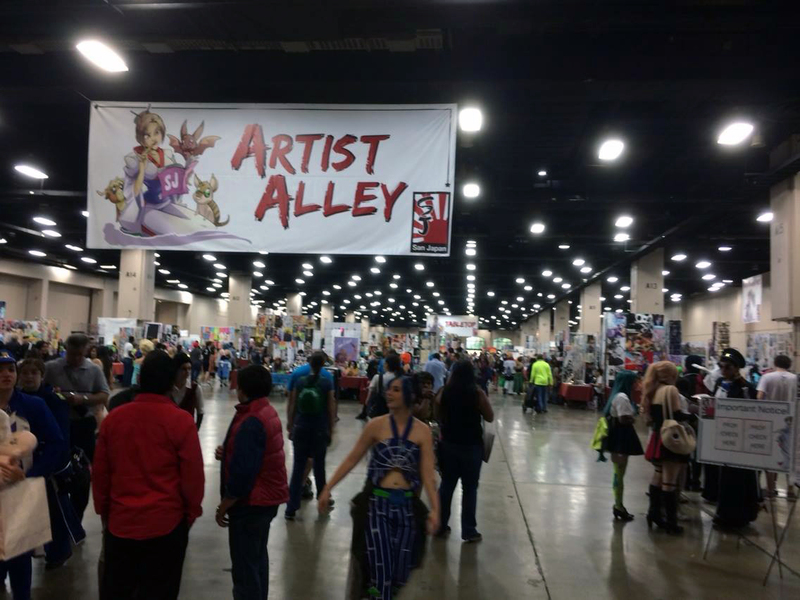 When it comes to an anime convention, there has to be an artist alley and dealer’s hall. San Japan had that and they were HUGE. Not only huge, but also diverse. All sorts of things to see, admire, buy, dream of buying and talk about with friends. I was able to find some cool stuff as well as some rare stuff like a copy of Dragonball Z: Sagas for the Gamecube [quite possibly one of the worst DBZ games ever] and a couple of hard to find Nadesico prints and cutouts from magazines which were vintage 1997. I was happy! The artist alley too was impressive with loads of talented people showing their works including one booth which sold a wonderful Toothless pendant I got for my girlfriend. So cute! Next to the artist alley was a special area for LARPing [live-action role playing] and foam samurai battles which looked like fun but I didn’t pluck up the courage to try it myself. All these activities came together to make a brilliant whole where you can easily spend a couple of hours trawling for some unusual wares and things to do. The gaming area next door too was plentiful with offerings including numerous Smash Brothers booths, DDR machines as well as a Para Para machine which is one of my favourites [the one where you move your hands in rhythm], such fun. There was even a Virtual ON machine! Happy days! The Henry B. Gonzalez Convention Centre, which hosted San Japan, was a vast venue with large rooms and airy social spaces but it was a little confusing to get used to initially; I did end up getting lost for the first day or two! However, you quickly acclimatise to the building and you start not running into empty halls. It was also able to host multiple events such as sports coach conferences as well as a teacher conference; how these people managed to cope with us awesome anime folk! In terms of guest duties’, I experienced my first VIP brunch with some attendees who had bought gold passes for San Japan. They joined the guests in a delicious brunch laid on by the Hyatt. I was placed on my own table as were the rest of the TeamFourStar gang and managed to fill half the table with some fans who wanted to eat and chat with me; I got some really cool people and it filled the two hour session nicely; I’d do it again! A surprise appearance was the music star TheLivingTombstone. He arrived on the Sunday morning and my girlfriend and I walked him around the con and helped him secure a decent meal and room for the night. He also got to meet some shocked fans of his who didn’t expect him to be there. I had known Tombstone for a while online but this surprise meeting was a welcome one. 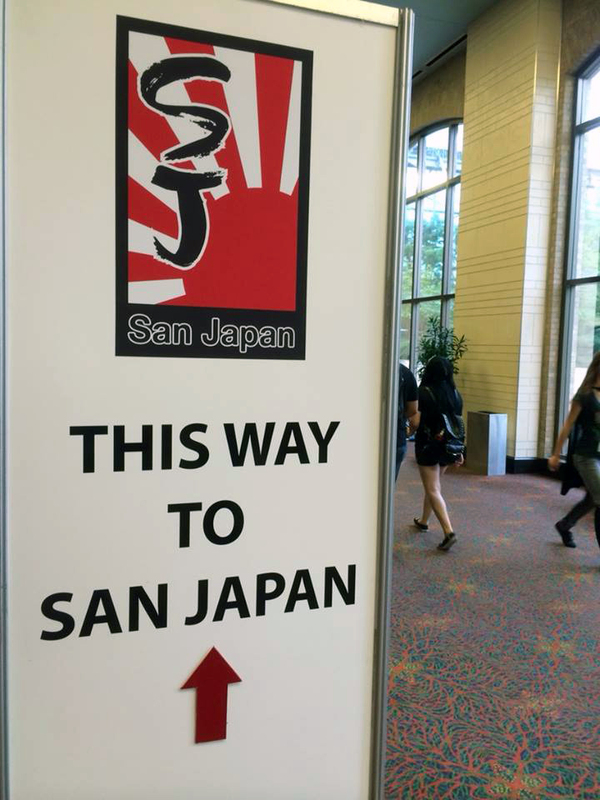 Was San Japan able to live up to the hype that preceded it? You bet! It was a blast! The Texas heat didn’t stop me from enjoying this charming convention and friendly staff who were always around to help make sure I got to my events on time and safely. Not only that, but I got to say hello to some of my voice acting heroes such as Lisa Ortiz and Chris Ayers; awesome! My big and warm thanks to Dave, Darcy, Molly and the countless tech staff who helped out on our panels – you guys made this convention special and I can thoroughly recommend this convention to anyone interested in anime. It has a lot of heart, a ferocious drive [it has plans for its development going through to 2018!!] and a focused staff. Big up to all the green shirts! For more information about the convention, go to San Japan’s website or follow them on Twitter! 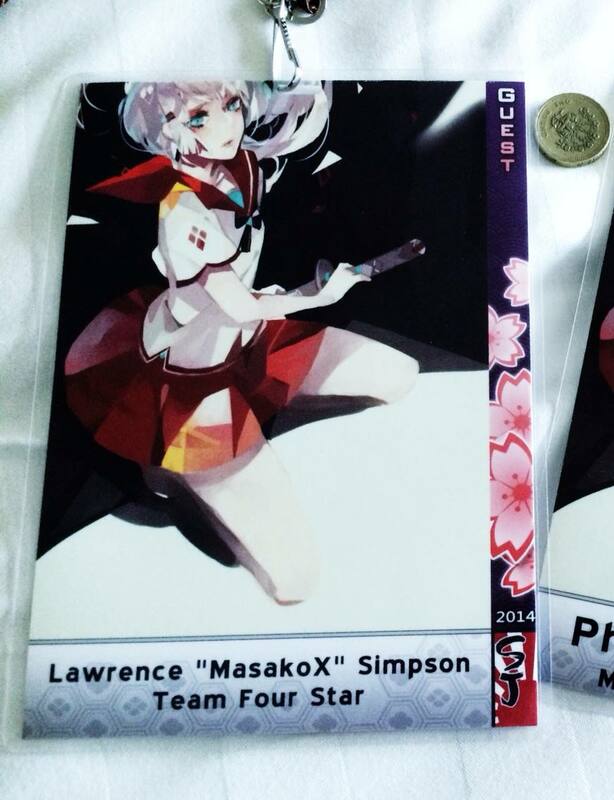 ADDITIONAL: Check out the size of the convention badges given to guests and staff – they were enormous! I included a pound coin for reference. 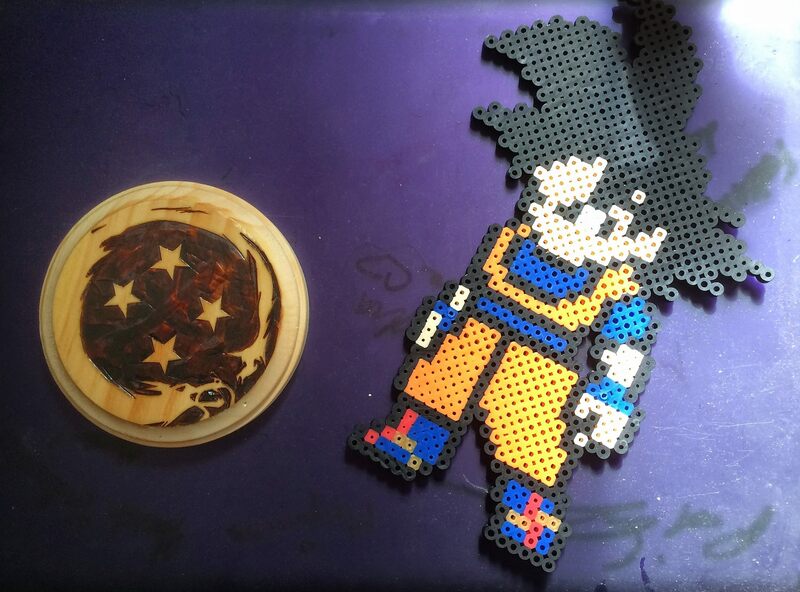 ADDITIONAL ADDITIONAL: Thank you so much to the fans who made these awesome gifts for me and the rest of the TeamFourStar bros. Team COAS-TAR! A quick update for everyone wishing to know what’s going regarding the summer updates. Well, put simply…they’re gonna be delayed until August mostly. Why? It’s simply down to the fact that I have four conventions in as many weeks and as such I will be doing a lot of travelling and unable to work at full capacity. Wireless internet is uncertain as well as scheduling. This means that the anime reviews for this season will be impacted but I will do my best to get out a summary post albeit not as comprehensive as the Spring one. For those asking, I WILL be covering the Sailor Moon remake in this list as it counts as a ‘new’ anime. This doesn’t mean that posts will cease this month. Con reports, editorials and at least one of the video reviews will be posted this month – this break from daily reviews may also lead to more posts dedicated to personal thoughts on anime; we’ll see how things go! AniCAST will be produced once schedules comes together for me and my first guest presenter; we have a voice actor interview for you too so watch this space for more soon! I will be at the following conventions this month – if you’re going, leave a comment and I’ll see you there! I am also considering about hiring a second reviewer to help me review shows, so if you’re interested, send an email with some examples! Catch you later and thanks for reading!